Aarau is the capital of the northern Swiss canton of Aargau. The city is also the capital of the district of Aarau. Most of the people in the municipality speak German. To the west of Aarau is the canton of Solothurn. It is the third-largest city in Aargau after Wettingen and Baden. The old city of Aarau lies on a rocky cliff where the Aar river valley narrows at the southern foot of the Jura mountains. Newer parts of the city can be found farther south of the river valley. The neighboring municipalities are Küttigen to the north, Rohr and Buchs to the east, Suhr to the south-east, Unterentfelden to the south, and Eppenberg-Wöschnau and Erlinsbach to the west. Aarau and the other municipalities have merged over the years. The only exceptions are Unterentfelden and Eppenberg-Wöschnau to the south, whose places are divided from Aarau by the large forests of Gönhard and Zelgli. A few artifacts from the Neolithic period were found in Aarau. Near the location of the present train station, the ruins of a settlement from the Bronze Age (about 1000 BC) have been excavated. The Roman road between Salodurum (Solothurn) and Vindonissa passed through the area, along the route now covered by the Bahnhofstrasse. In 1976 divers in the Aar found part of a seven-meter wide wooden bridge from the late Roman times. Aarau was founded around 1240 A.D. by the counts of Kyburg. The first certain reference to the city dates to 1256. The town was ruled from the "Rore" tower, which has been incorporated into the modern city hall. In 1273 the counts of Kyburg died out. Agnes of Kyburg, who had no male relations, sold the family's lands to King Rudolf I von Habsburg. He granted Aarau its city rights in 1283. In the 14th Century the city was expanded in two stages, and a second defesive wall was constructed. A deep ditch separated the city from its "suburb;" its location is today marked by a wide street named "Graben" (meaning Ditch). In 1415 Bern invaded lower Aargau with the help of Solothurn. Aarau capitulated after a short resistance, and was forced to swear allegiance to the new rulers. In the 16th Century, the rights of the lower classes were abolished. In March 1528 the citizens of Aarau allowed the introduction of Protestantism at the urging of the Bernese. A growth in population during the 16th Century led to taller buildings and more dense construction methods. Early forms of industry developed at this time; however, unlike in other cities, no guilds were formed in Aarau. Starting in the early 18th century, the textile industry was established in Aarau. German immigration contributed to the city's favorable conditions, in that they introduced the cotton and silk factories. These highly educated immigrants were also responsible for education reform and the enlightened, revolutionary spirit that developed in Aarau. On December 27, 1797, the last Tagsatzung of the Old Swiss Confederacy was held in Aarau. Two weeks later a French envoy continued to foment the revolutionary opinions of the city. The contrast between a high level of education and a low level of political rights was particarly great in Aarau, and the city refused to send troops to defend the Bernese border. By Mid-March 1798 Aarau was occupied by French troops. 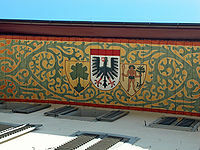 On March 22, 1798 Aarau was declared the capital of the Helvetic Republic. It is therefore the first capital of a unified Switzerland. Parliament met in the city hall. On September 20, the capital was moved to Lucerne. In 1803, Napoleon ordered the fusion of the cantons of Aargau, Baden and Fricktal. Aarau was declared the capital of the new, enlarged canton of Aargau. In 1820 the city wall was torn down, with exception of the individual towers and gates, and the defensive ditches were filled in. The wooden bridge, dating from the Middle Ages, across the Aar was destroyed by floods three times in thirty years, and was replaced with a steel suspension bridge in 1851. This was replaced by a concrete bridge in 1952. The city connected to the Swiss Central Railroad in 1856. The textile industry in Aarau broke down in about 1850 because of the protectionist tariff policies of neighboring states. Other industries had developed by that time to replace it, including the production of mathematical instruments, shoes and cement. Beginning in 1900, numerous electrical enterprises developed. By the 1960s, more citizens worked in service industries or for the canton-level government than in manufacturing. During the 1980s many of the industries left Aarau completely. In 1802 the Canton School was established; it was the first non-parochial high school in Switzerland. It developed a good reputation, and was home to Nobel Prize winners Albert Einstein, Paul Karrer, and Werner Arber, as well as several Swiss politicians and authors. The purchase of a manuscript collection in 1803 laid the foundation for what would become the Cantonal Library, which contains a Bible annotated by Huldrych Zwingli. More newspapers developed in the city, maintaining the revolutionary atmosphere of Aarau. Beginning in 1820, Aarau has been a refuge for political refugees. The urban educational and cultural opportunities of Aarau have been extended through numerous new institutions. A Theater and Concert Hall was constructed in 1883, which was renovated and expanded in 1995-96. The Aargau Nature Museum opened in 1922. A former cloth warehouse was transformed into a small theater in 1974, and the alternative culture center KIFF (Culture in the fodder factory) was established in a former animal fodder factory. The earliest use of the place name was in 1248 (in the form Arowe), and probably referred to the settlement in the area before the founding of the city. It comes, along with the name of the River Aar (which was called Arula, Arola, and Araris in early times), from the German Au, meaning floodplain. The historic old city forms an irregular square, consisting of four parts (called Stoecke). To the south lies the "suburb", that is, the part of the town formerly outside the city wall. One special characteristic of the city is its painted gables, for which Aarau is sometimes called the "City of beautiful Gables". The buildings in the old city originate, on the whole, from building projects during the 16th century, when nearly all the Middle Age period buildings were replaced or expanded. The architectural development of the city ended in the 18th century, when the city began to expand beyond its (still existing) wall. Most of the buildings in the "suburb" date from this time. 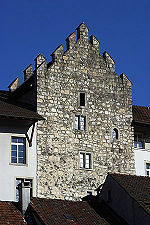 The "Schlössli" (small Castle), Rore Tower and the upper gate tower have remained nearly unchanged since the 13th century. The "Schlössli" is the oldest building in the city. It was already founded at the time of the establishment of the city shortly after 1200; the exact date is not known. City hall was built around Rore Tower in 1515. 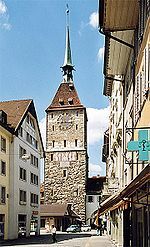 The upper gate tower stands beside the southern gate in the city wall, along the road to Lucerne and Bern. The jail has been housed in it since the Middle Ages. 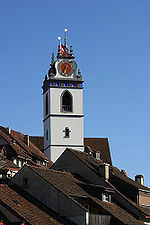 A Carillon was erected in the tower in the middle of the 20th century, the bells for which were provided by the centuries-old bell manufacturers of Aarau. The town church was built between 1471 and 1478. During the Reformation, in 1528, its twelve altars and accompanying pictures were destroyed. The "Justice fountain" (Gerechtskeitbrunnen) was built in 1634, and is made of French limestone; it includes a statue of Lady Justice made of sandstone, hence the name. It was originally in the street in front of city hall, but was moved to its present location in front of the town church in 1905 due to increased traffic. 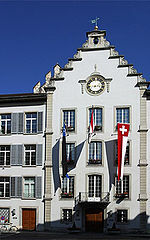 The people that give the most jobs in Aarau is the canton government; most of their offices can be found throughout the city. One of the two head offices of the Aargauer Zeitung, Switzerland's fifth largest newspaper, can be found in Aarau. Kern & Co., founded in 1819, was an internationally known geodetic instrument manufacturer based in Aarau. However, it was taken over by Wild Leitz in 1988, and was closed in 1991. More than half of the workers in Aarau live in the city's suburbs, or on the outskirts of the city. Aarau gets some jams of cars and buses sometimes during rush hour (the time of day when everyone leaves work to get home). Things made in Aarau are: bells, mathematical instruments, electrical goods, cotton textiles, chemicals, shoes, and other products. Ferdinand Rudolph Hassler, (1770-1843), first director of the United States Coast Survey. ↑ "Aarau." Encyclopædia Britannica, 20 December 2006. ↑ Who Was Who in America, Historical Volume, 1607-1896. Chicago: Marquis Who's Who. 1963. Wikimedia Commons has media related to Aarau. Wikisource has the text of the 1911 Encyclopædia Britannica article Aarau. This page was last changed on 9 March 2015, at 05:25.